This book helps children identify different types of car by colour using simple, repetitive text which reinforces common colour words. Cars are shown both in close-up and in action in its surroundings, driving in the city, off the road or tearing around a Grand Prix circuit. 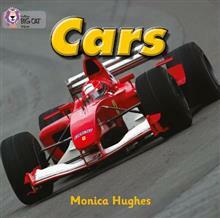 Internationally-renowned children's author, Monica Hughes was a master of science fiction and fantasy writing. She was the recipient of numerous awards and was the author of The Isis Trilogy and A Handful of Seeds. She has written a number of titles for the Collins Big Cat series.